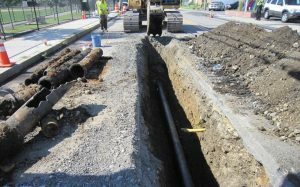 In November 2015, during the replacement of the water main along Tremont Street, an odor was noted emanating from the trench excavated to install a temporary water supply to the City of Melrose Department of Public Works (DPW) building. A reportable release condition was subsequently found at the property and a former gasoline pump dispenser is the suspected source of the release. Tata & Howard provided Licensed Site Professional (LSP) services for the project that included the observation of a test pit, drilling soil borings, installation of groundwater monitoring wells, soil sampling, and groundwater sampling. The initial soil sampling results indicate the presence of residual gasoline contaminants at concentrations exceeding the applicable Massachusetts Department of Environmental Protection (MassDEP) Reportable Concentrations. Therefore, Tata & Howard assisted the City with notifying MassDEP of the release. Soil borings were drilled and soil samples were collected to delineate the extent of the release and to assess the source of the release, which is suspected to be a former gasoline dispenser that was removed in 1999. Tata & Howard conducted a Method 1 Risk Characterization to evaluate the risk of harm to health, safety, public welfare, and the environment posed by the presence of residual gasoline contaminants in soil. The results of the Method 1 Risk Characterization indicate that a condition of No Significant Risk exists for current and future foreseeable activities at the Site and an Activity and Use Limitation is not necessary to maintain a level of No Significant Risk. Tata & Howard prepared a Permanent Solution with No Conditions Statement to document these findings and submitted the report to MassDEP. WORK Inc. provides onsite training and employment for disabled individuals, most of whom have significant developmental or cognitive disabilities. WORK Inc. is fully accredited by the Commission on Accreditation of Rehabilitation Facilities with its highest rating, and licensed by the MA Department of Developmental Services. As a human services agency, WORK Inc. places a high premium on human health and safety. It has a health and safety committee, with external members including an insurance risk manager, to ensure that the agency is engaging in safe practices with minimal, if any, risks to human health and the environment. 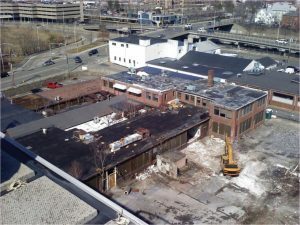 In 2008, WORK Inc. decided to relocate from 3 Arlington Street in Quincy, Massachusetts to Dorchester, Massachusetts because the buildings at the Quincy site were in extremely poor condition. When a due diligence assessment was performed at the Quincy site, several contaminants, including chlorinated volatile organic compounds (CVOCs), arsenic, cadmium, lead, and nickel were detected in soil and groundwater. The sources of these compounds were found to be a former foundry, machine shop, and plating facility that were located at the site well before WORK Inc. took ownership. Because they did not cause the contamination, WORK Inc. was eligible for a Brownfields Grant from the USEPA to pay for the cleanup. T&H assisted with the preparation of the grant application and a remedial grant of $200,000 was received by WORK Inc. – the first eligible party in the entire City of Quincy to receive such funds. 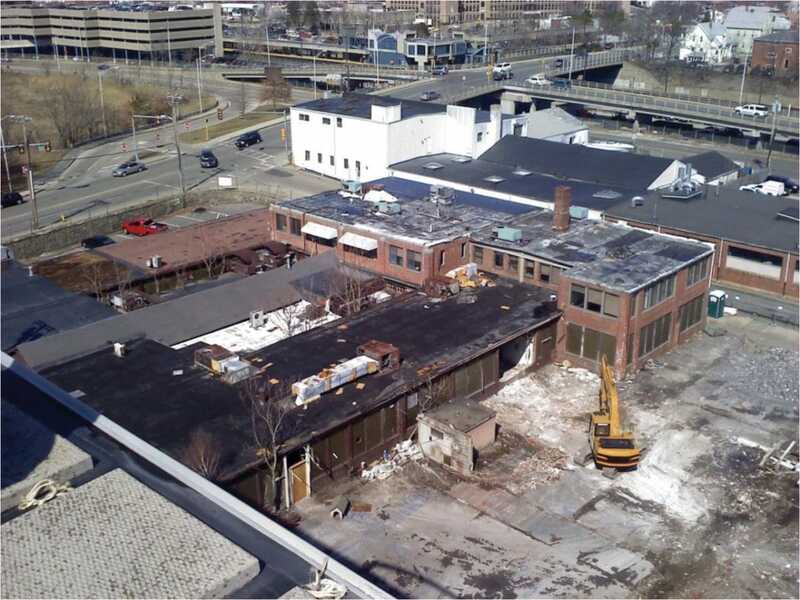 In November 2009, WORK Inc. moved to the Dorchester facility and the Quincy facility was razed in spring 2011 to allow for redevelopment and to give better access to the contaminated soil and groundwater. The demolition project was coordinated by T&H, who provided field observation and coordination services. 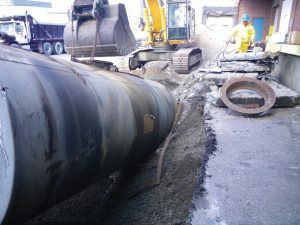 Approximately 800 cubic yards of metals contaminated soil were excavated and disposed offsite. During the excavation, T&H collected soil samples from the sidewalls and bottoms of the excavations for screening with a portable x-ray fluorescence (XRF) analyzer. Soil samples from the periphery of the excavation were then sent for confirmatory analyses at a laboratory to verify that significant concentrations of metals do not remain in soil at the site. To address the CVOCs, T&H coordinated the drilling of four membrane interface probes (MIPs) to gather continuous CVOC data that were used to further define the vertical and horizontal extent of contamination and soil stratification. These data indicate that the highest response to CVOCs was an approximate ten foot zone of soil located just above the bedrock. Based on the MIPs data, T&H observed the installation of deep groundwater monitoring wells that were constructed with short screen sections set on top of the bedrock. T&H is currently implementing a pilot test to evaluate the effectiveness of enhanced bioremediation for the remediation of the CVOCs in groundwater. Tata & Howard provided site assessment and underground storage tank (UST) removal services for a private client. The Site is a former commercial manufacturing and warehouse facility located in an industrial area of Boston, MA. It is occupied by a single story, 76,000 square foot commercial warehouse food market and commercial restaurant wholesaler. Initial assessment by a prior consultant identified petroleum related compounds and styrene in indoor air, the source of which was, according to them, a UST located outside the building. Tata & Howard was called in to give a second opinion and was given a very short time frame because the client would lose their $4,000,000 deposit if they did not buy the property within three weeks. Their bank told them that no other consultant could meet their deadline but the borrower’s attorney recommended they contact Tata & Howard. We first identified that styrene is not associated with petroleum. Therefore, there had to be another source of this compound. We immediately went to the site and saw that much of the food is wrapped in plastic, and numerous plastic plates and utensils are stored there as well. This appeared to be the more likely source of the styrene as well as the petroleum in the indoor air. To test this hypothesis, we drilled several holes through the concrete slab to test the sub slab soil gas. First, we found that the slab was almost three feet thick, lending further credibility to the theory that the contaminants in the air were not from beneath the slab; the concrete was too thick to allow any vapors through. Further site testing including sub slab soil gas analyses, which had no styrene and very little petroleum present, confirmed this theory. Based on the findings of the assessment activities, the results indicate that a level of No Significant Risk exists for presence of these compounds at the disposal site. These findings, along with the additional information presented, support the applicability of a Class B-2 RAO to the disposal site. Remedial action was not necessary to achieve a condition of No Significant Risk and the client did not lose their $4,000,000 deposit. Tata & Howard is providing design and construction administration services associated with expansion of the Legacy Farms private wastewater treatment facility and effluent disposal areas from 115,000 gallons per day (gpd) to 190,000 gpd, which consists of the installation of additional membrane cassettes to increase the capacity from 115,000 gpd to 150,000 gpd, installation of additional membrane modules, installation of mechanical equipment fully redundant at a maximum daily flow of 190,000 gpd, permitting assistance with MassDEP, and the construction of two additional effluent disposal areas. Construction of the first of two new effluent disposal areas is underway, and T&H Project Engineer and Certified Soil Evaluator Matt Barry was recently on-site to conduct a perc test for the second effluent disposal area. 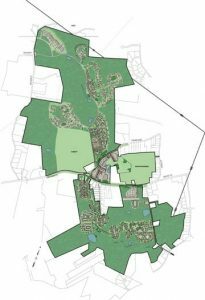 Tata & Howard provided soil investigation and evaluation, preliminary design, and design services for an onsite wastewater treatment facility and disposal system to serve the proposed Legacy Farms mixed-use development in Hopkinton, Massachusetts. The Legacy Farms development includes a retail village, a commercial district, a variety of residential spaces (apartments, town homes, single-family homes, and multi-family structures) on approximately 733 acres currently used for nursery and agricultural uses. Approximately 940 new dwellings, 450,000 square feet of retail and commercial space, and 500 acres of restored open space will be made available by the project. 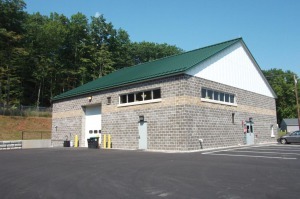 Tata & Howard’s services have included development of treatment flows for the full, built-out project, as well as selection and design of the wastewater pumping treatment and disposal systems that were compatible for the site configuration and soils, and that would provide the level of treatment required by the Massachusetts Department of Environmental Protection (MassDEP). The challenge was satisfied by the design for a phased approach to the construction of a membrane bioreactor (MBR) treatment system, which provides a high level of treatment. The project includes three submersible pump stations that serve the wastewater treatment facility (influent, recirculation, and effluent disposal) and two submersible pump stations within the development itself. 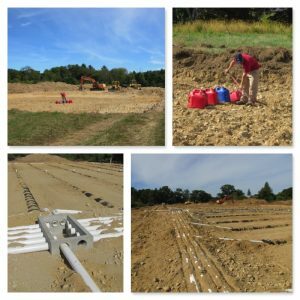 Disposal of treated effluent at the Legacy Farms site will be managed by a combination of conventional leaching systems and an innovative use of drip irrigation, the first large-scale application of drip irrigation for disposal of treated effluent in the State of Massachusetts. The success of this project was related to excellent communication between Tata & Howard and the client, and a strong working relationship with MassDEP.